Atlantic Uniform has been a leading provider of uniforms, apparel, and equipment since 2000. Gary DeRogatis, our CEO, acquired the company after it had been in business as Katzin’s for over forty years! His vision is to create the leading resource in New Jersey for public service and school uniforms, apparel, accessories and equipment. 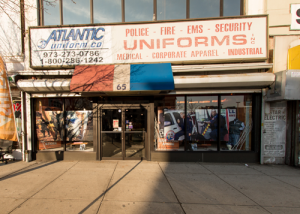 The two Atlantic Uniform stores have expanded beyond public service unifirmns and apparel, and now encompass school uniforms for several New Jersey K-12 school systems, and the Newark location even has a state-of-the-art door breaching training system. Atlantic Uniform is a sought after resource for outfitting academy candidates, as well. As your career moves, so will your uniform needs. Atlantic Uniform and it’s wholly-owned subsidiary Brick City Embroidery, excel at customizing and tailoring your new uniform. Whether Police, Fire, EMS, or Postal departments or someone just looking for the best selection of workwear, Atlantic Uniform will exceed your expectation. Our team has been working together for many years, and are highly knowledgeable with products from the top brands and manufacturers. Our retail stores are conveniently located, in downtown Newark and in Belleville. And if your department has a special need, one of our specialists will gladly make a presentation in your offices. Atlantic Uniform can accommodate all of your needs, from flashlights to footwear, custom uniforms, municipal embroidery projects, and special orders. Our team members are driven to please our customers and welcome satisfying their special needs. If you or your agency has a special request make Atlantic Uniform your first stop. 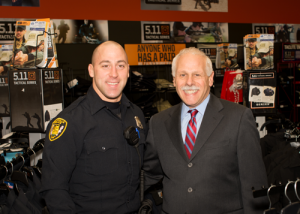 Atlantic Uniform is one of the top 5.11 Tactical retailers in the nation! We are also stock great products from Carhartt, Blauer, Wolverine, Rocky Boots, Bates, Dickies, and other recognized leading manufacturers. Become a subscriber to Atlantic Uniform’s email list and get notified of our special product workshops and demonstrations. We also share special sale opportunities with our subscribers before the general public. 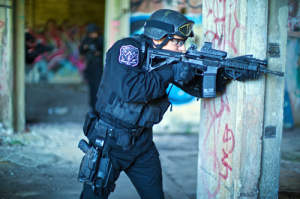 "Atlantic Uniform provided everything I needed when I entered the Academy. Plus Elena knew all of the "little things" that helped make my entrance easier, and helped me to get properly fitted." "I buy my weekend clothes at Atlantic Uniform. I really like the look, plus the quality is more durable. They have a great selection and their prices are good. You should check it out." "I had to order a new uniform, because of a promotion, and needed it quickly. Atlantic Uniform was able to properly git me and provide the uniform and customize it very quickly. Thanks Phil!"